We Wrote the Book on Home Comfort! At Dr. Energy Saver, our mission is to help homeowners everywhere make their homes more comfortable and efficient. In order to help make all our home comfort solutions easily available to you, we've created our "Home Comfort Science" book, a 96-page, full color book that details all types of home comfort and energy problems and how Dr. Energy Saver can help you solve them. If you have problems with uncomfortably hot or cold rooms, uneven temperatures throughout the house, or high heating and cooling bills, we can help. We believe our book is the best publication available for explaining how houses use energy, lose energy, and can become much more comfortable and energy efficient with the right improvements. Don't risk wasting your money by making energy upgrades in a haphazard way. Instead, learn how a prioritized approach to energy efficiency can maximize your savings. Contact Dr. Energy Saver today to schedule a home energy audit for your house. 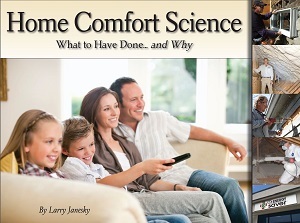 Before we inspect your home, we'll you a free copy of "Home Comfort Science". Call us today or click below to receive your complimentary copy! Dr. Energy Saver focuses on a "whole house" approach to home comfort and energy efficiency that is designed to provide maximum results for resolving comfort issues and reducing heating and cooling costs. Our book is your first step towards determining which energy efficiency upgrades will be the best for your home, and it's a great way to get some questions ready when our experts meet you for your home energy audit. We'll show you the details every step of the way, with great graphics and many photos from the field. If you're ready to make your home more comfortable and start saving money, call your local Dr. Energy Saver today to schedule your home energy audit and get your free copy of "Home Comfort Science"! We provide complete solutions for all types of home energy problems!